Gulfstream Park will have average daily all-sources handle of just over $4.6 million for its spring meet. That will be the fourth straight meet in which the Hallandale Beach thoroughbred track has achieved double-digit percentage handle growth. Gulfstream will end its 60-day spring meet on Thursday, and begin is summer meet on Friday. The summer meet will extend through Oct. 2. The $4.6 million average is through Sunday and is based on HorseracingFLA’s review of Equibase charts. That review also showed that Gulfstream averaged about 7.8 starters per race for this year’s spring meet. Exact comparisons with Gulfstream’s 2015 spring meet are not yet readily available. On Saturday, Gulfstream vice president and general manager of racing P.J. Campo told us that all-sources handle is up about 12 percent for the current meet. That indicates the daily average was about $4.1 million for last year’s spring meet. This Friday, Gulfstream plans to release full-meet data that will have comparisons with the 2015 spring meet. 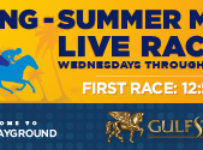 The comparisons likely will include breakdowns of components (live and off-site) on betting on Gulfstream races. One reason for Gulfstream’s strong spring handle numbers is that there were only four days when weather conditions forced it to take any races off the turf. As of Sunday, it moved a total of 12 races from turf to dirt. Gulfstream ran about 55 percent of its spring 2016 races on turf—a surface that is popular with bettors partly because turf races usually have larger fields than dirt races. 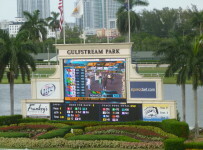 Gulfstream plans to have about half of its summer meet races on its wide turf course. During the meet all of its turf races will be on the outer part of the course, with rail positions between 72 feet and 108 feet. Gulfstream will refurbish its turf course during October and November, when it holds its annual Gulfstream Park West meet at Calder. All-sources handle (total handle) is the combination of these bets on a track’s races: live on-site; simulcast betting at other-pari-mutuels and Off-Track Betting locations; computer and phone Advanced Deposit Wagering services; legal sports books in Nevada and in several off-shore jurisdictions. 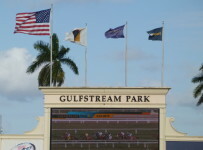 Throughout this year’s spring meet, Gulfstream officials have said the track is continuing to reach its goals in handle. They note that spring and summer racing, which Gulfstream began in 2013, is becoming more widely accepted among simulcast and ADW bettors and that its roster of year-round trainers and jockeys is continuing to grow and strengthen. Mark Casse, Ralph Nicks, Amy Tarrant, Chuck Simon and Michelle Nihei are among trainers on that list. This year, Elvis Trujillo and Cornelio Velasquez began riding year-round in South Florida.